MMM....I've downloaded the BF2 Hub again, but still get a "Database Error" message when I try to log on to the game...Anyone else having this problem or now what's the matter or how to fix it? Are you sure it's enabled for their server info? The launcher allows to switch between them and not. I got that error when I tried before switching it. also same for an alternate log-in....................I think we are screwed?? And most people are not going to do this. There was already a lot of time during the day that no one was online, now I'd imagine that will just get worse, not better. Which means the game is pretty much dead. Or not, but either way, there will be far fewer players. yea got the error message today too Bay..was looking to dl the launcher but do you have to rollback a patch before you dl it?.. If you registered with Battlelog you can download their launcher. Careful with revive/battlelog: with the mods and fancy extras they're trying to build into their service/launcher, it may conflict with your graphics card/drivers, causing black spots on open terrain. It looks to be a temporary conflict--connecting through bf2hub doesn't cause graphics issues/conflicts. Verified this with hotshoter, who was having the glitches. Posts are popping up at the battlelog forums about this issue. Hotshoter would rather use Revive for the possibility of keeping his old account and stats (since he backed-up with revive but not hub), but there is a possibility that old stats may eventually be restored in Hub, even if you didn't back them up in time. I say this since revive is saying this may be the case for them, and supposedly revive and hub are in (was?) some collaboration of their log-in/stats servers. That, and stats are out there on the internet--possibly they may be pulled from some location for restoration in the future. Hotshoter tried different drivers, system restores (then reinstalling revive)--the only thing that worked was using hub, creating a new alias/soldier, and voila, no glitches. Whatever revive is doing, it's only a temporary instance--it doesn't seem to permanently ding graphics. Hub also logs in almost as fast as Gamespy/EA did, whereas revive takes a long time. And Google shaders_client.zip and TerrainShader_Hi.fx as keywords. 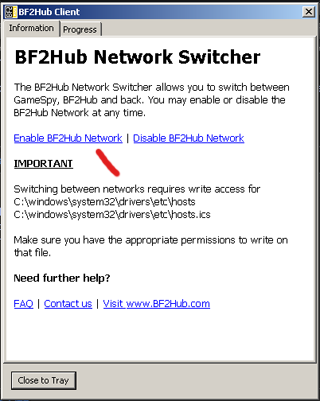 Finally, some have had issues with getting errors when they use hub, clicking the link to switch to the hub servers. It basically says you don't have write permissions. First off, if using 64 bit OS, make sure hub installs to C:\Program Files (x86)\ . . . not just \Program Files\. 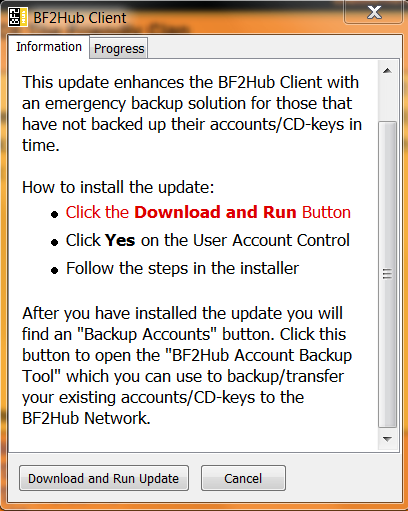 Also make sure any anti-virus is off during install, too, just to cover bases. And make sure you have admin rights. Also make sure you have system/hidden files and folders viewable. If you're using XP still, the directions are similar to the following directions for Win7, but you have to directly change the properties of the specific "hosts" and "host.ics" files instead of just the "etc" folder they are in. For the majority on Win7, go to your OS installation drive (usually C:) and Windows. Typical path is C:\Windows\System32\drivers\etc. Right click the etc folder and choose properties. On there should be a Security tab and maybe an advanced button. In here you basically want to make sure nothing is set to hidden or read-only, and that all permissions are granted, not just special. The folder and the files in it (specifically hosts and hosts.ics) must be able to be read from and written to. Apply, OK, then try the enable link in Hub. Should work. HTH.